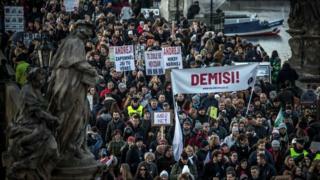 Protesters in Prague are holding a rally against embattled Czech Prime Minister Andrej Babis, a day after he vowed he would “never resign”. The protest comes on the 29th anniversary of the Velvet Revolution, the peaceful overthrow of communism in former Czechoslovakia. Mr Babis is facing allegations that he defrauded the EU, which he denies. He also denies having his son, Andrej Babis Jr, kidnapped and held in Crimea to stop him testifying in the case. The son made the allegations to reporters from the Seznam news site, insisting he was taken against his will. The 35-year-old’s disappearance coincided with a police investigation into his billionaire father, who was accused of hiding the fact he owned a farm and conference centre known as “Stork’s Nest”, so it would qualify for EU small business subsidies. According to Seznam, Mr Babis Jr said his father wanted him far away from the criminal inquiry, and had given him a choice between “taking an extended holiday” in Crimea – or being locked up in a mental home. Prime Minister Babis has said his son is schizophrenic, and condemned a “witch-hunt” against his family. “No-one kidnapped my son. He travelled from the Czech Republic voluntarily. This matter has been investigated by the police, which came to the conclusion that no kidnapping had taken place,” he said. The interview with Mr Babis Jr was secretly filmed by journalists using a camera hidden in a pair of glasses – which the Czech leader called highly unethical. A day later, protesters discarded wreaths laid by Mr Babis and President Milos Zeman in honour of the Velvet Revolution. Czech opposition parties have sought a no-confidence vote against Mr Babis’s government, which is expected to be held on 23 November. Should he lose, the president has vowed to reappoint Mr Babis.